How I did it, or "HOWTO Roll your own"
The current version of my scripts is available. It includes scripts to create chrooted build environments for 3.0, 3.0 Respin 2, the beta of RHEL4 and a early draft of the scripts for WBEL4. So far this has been question #1, so here are some details on how this distro was assembled. I didn't take enough detailed notes to answer every question. 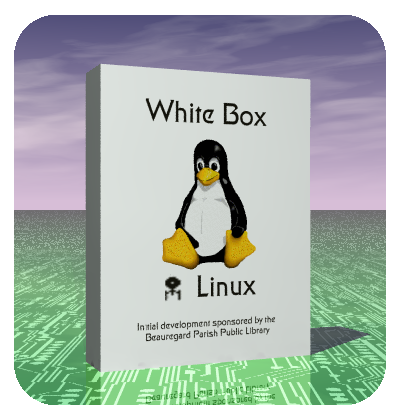 I am however planning to rebuild White Box on itself as the next step, to make sure it is self hosting. More details will be posted then. To begin I installed Taroon-beta on a midrange server, a Dual Xeon 2.4Ghz with 2GB of memory and an Intel RAID controller. To begin I started rebuilding taroon-beta on itself. As anyone who did any rebuilding on the beta will attest, it was missing a LOT of -devel packages. There was also a nice circular dependency between Ghostscript and Gimp-Print. But several loops of build, install -devel, debug, repeat yielded a high success percentage and the failed builds were limited to userland packages such as OOo and emacs. If you can't find them elsewhere, I have a local copy but please be gentle, we are in a bandwidth poor area and I found them all at RPMFind. #Make an entry for each package. echo "No packagelist. Try generaterpmlist." # the logs from the last build attempt. btw, a full run on the hardware I have available takes around 25 hours. When the SRPMS for RHEL3 became available I was ready. All I had to do was clean out /usr/src/redhat and start building. Found a couple of missing build dependencies in the final SRPMS (Bugzilla #108566 and #108566) but things worked better than expected. Remember to build the i686 kernel, glibc and openssl packages and the athlon kernel manually because the script above won't. Note that a user named buildsys needs to exist to build the comps and rpmdb packages, but has no special requirements. Also, to build the rpmdb package you either need to make sure one isn't installed on the build machine or patch the .spec file. I opted for leaving it uninstalled. The next step was actually rebuilding a running distro. To populate the tree I dumped the taroon-beta CD1 into /usr/local/rebuild/en/3.0/i386 and filled the RedHat/RPMS and SRPMS directories. Next was figuring out how to do all the fiddly bits. First of all, go ahead and do export PYTHONPATH=/usr/lib/anaconda because several of the scripts will fail without it. Rebuild the rpmdb package, again moving the RPM into place and removing any existing copy. p.s. There is method in my apparent madness of typing out complete paths. Several of the utilities failed in unexpected places with relative paths so I got into a habit of just spelling them out completely even when a file was in the current directory. If any warnings appeared in either of the two steps above, hit the UP arrow and run them again. They depend on each other so just run em til they stop complaining. Now you can run buildinstall. But unless you have the White Box anaconda-runtime rpm installed you need to fix a fatal bug on line 165. Edit it and add double quotes around $RELEASESTR and $PRODUCTSTR. From here you can copy /usr/local/rebuild/en/3.0/i386/images/bootdisk.img and /usr/local/rebuild/en/3.0/i386/images/drvnet.img to floppies, share out /usr/local/rebuild/en/3.0/i386/ and perform a network install. If you also got my openssl problem in your build it will install and fail when running firstboot, discussed elsewhere. Once you have a set of packages that run, if you used the RedHat SRPMS you need to move on to trademark removal, a topic discussed below. This gets you six subdirectories in your current directory full of hard links back to the main tree. Now you need to regenerate the hdlist with disc numbers. If you want to keep the main tree untouched you should delete i386-disc1/RedHat/base/hdlist* before the next step, but it shouldn't matter since a set of CD's dumped into a directory will work for network installs. Burn the ISOs and test. Ok, you have a home rolled RHEL. But you can't redistribute RHEL without incurring the wrath of Red Hat's trademark lawyers so now begins the fun part. The EULA only says you must change the redhat-logos and anaconda-images packages. Yea, right. I know I didn't want to put up ISO images with RedHat's name all over it on a server in the reach of US law. Changed /etc/redhat-release to whitebox-release This implies several other changes, including inittools and multiple references inside anaconda. Only a small edit was required to get rpmdb-whitebox. Replaced the RedHat advert in indexhtml so that a big RedHat logo wouldn't appear on the first launch of Mozilla. Still need to fix Mozilla itself to expunge the RHN link and other RH mods. Loopback mount /usr/local/rebuild/en/3.0/i386/RedHat/base/product.img and replace pixmaps/splash.png with your own splash screen, dump /usr/lib/anaconda/installclasses/*py into installclasses (edit as appropriate to your needs) and edit .buildstamp to use your name/version. Yes there is a script to remake it from anaconda-product but I found it quicker to manually fix it than figure it out.